In diabetic patients, accelerated glycation process causes increased oxidative stress and chronic hyperglycaemia that play a vital role in the diabetic complications. Extensive intracellular and extracellular generation of these glycated products finally form advanced glycation end products (AGEs). The accumulation of AGEs is related with the intensive risk for microvascular and macrovascular injuries for diabetic patients. Therefore, formation of AGEs results from the condensation of reducing sugars with biomolecules like nucleic acids, proteins, and lipids which potentially alter their function. Effect of AGEs formation is also related with the cross-linking that promotes vascular stiffness which modifies the vascular structure and long-life function of proteins. Formation of AGEs may also activate specific receptors, like receptor for AGEs (RAGEs) that induce the intracellular signaling which enhance the oxidative stress and also the amplification of key pro-sclerotic and pro-inflammatory cytokines. From last few decades, a huge number of pre-clinical studies related with the AGEs formation in the diabetic patients have been performed. The target for such trials was the formation and degradation of AGEs, and its interaction with RAGEs. This review focuses on the mechanism how these AGEs exert detrimental nuisance in the diabetes, as well as deal with existing strategies to disrupt the action or formation of AGEs. 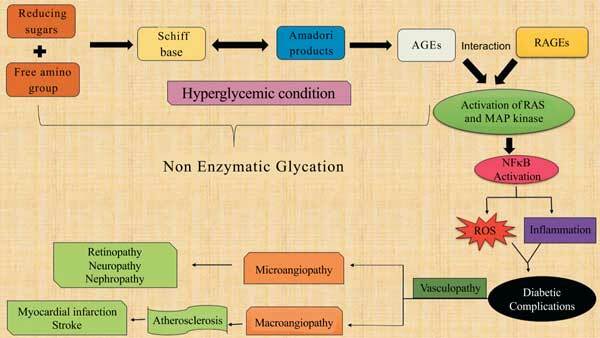 Therefore, the unseen role of both the early and advanced stage glycation in the diabetic Vasculopathy is described. We have also illustrated how the glycation inhibition results in the delay of the development of vascular complications in diabetic patients. Keywords: Advanced glycation end products (AGEs), receptor for AGEs (RAGEs), reactive oxygen species (ROS), glycoxidation, diabetes, vascular complication. Keywords:Advanced glycation end products (AGEs), receptor for AGEs (RAGEs), reactive oxygen species (ROS), glycoxidation, diabetes, vascular complication. Abstract:In diabetic patients, accelerated glycation process causes increased oxidative stress and chronic hyperglycaemia that play a vital role in the diabetic complications. Extensive intracellular and extracellular generation of these glycated products finally form advanced glycation end products (AGEs). The accumulation of AGEs is related with the intensive risk for microvascular and macrovascular injuries for diabetic patients. Therefore, formation of AGEs results from the condensation of reducing sugars with biomolecules like nucleic acids, proteins, and lipids which potentially alter their function. Effect of AGEs formation is also related with the cross-linking that promotes vascular stiffness which modifies the vascular structure and long-life function of proteins. Formation of AGEs may also activate specific receptors, like receptor for AGEs (RAGEs) that induce the intracellular signaling which enhance the oxidative stress and also the amplification of key pro-sclerotic and pro-inflammatory cytokines. From last few decades, a huge number of pre-clinical studies related with the AGEs formation in the diabetic patients have been performed. The target for such trials was the formation and degradation of AGEs, and its interaction with RAGEs. This review focuses on the mechanism how these AGEs exert detrimental nuisance in the diabetes, as well as deal with existing strategies to disrupt the action or formation of AGEs. Therefore, the unseen role of both the early and advanced stage glycation in the diabetic Vasculopathy is described. We have also illustrated how the glycation inhibition results in the delay of the development of vascular complications in diabetic patients. Antioxidant Therapy in Diabetic Complications: What is New?